Revolution 21's Blog for the People: 3 Chords & the Truth: Let it snow! Welcome to October 10 on the Great Plains. Now that the produce is in and the wheelbarrow has gone fallow under an autumnal coating of snow, it's a good time to grab a hot cup of something, prop up your feet and enjoy another episode of 3 Chords & the Truth. After all, that's what winter's for. Even when it comes in the middle of fall. TODAY'S EPISODE of the Big Show is a good 'un . . . and decidedly New Wavish. What can I say? Sometimes I get in moods. But this mood has led to some fine tunes for watching the leaves change -- or the snow fall. Just don't trip on your Snuggie (as seen on TV) if you get an urge to dance. Consider this a consumer warning about dancing to 3 Chords & the Truth while wearing a Snuggie. I don't want none of your dang lawsuits. So . . . there you go. 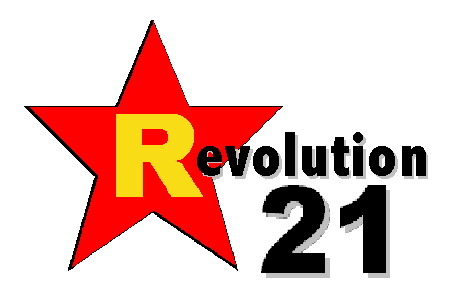 The weather outside is frightful, but the music on the Revolution 21 website is delightful. Let it snow! Let it snow! Let it snow! It's 3 Chords & the Truth, y'all. Be there. Aloha . . . ha . . . ha . . . CHOO!